We were twenty-seven days into a thirty day road trip. With the reality of start dates at work looming around the corner, the most sensible thing for us to do would have been to ignore all detours and get home quickly and efficiently. Sensible is for the birds. There were four hours left on this leg of our journey. With six hours of road behind us through British Columbia, we noticed a tiny black dot on the coastline labeled: Hyder, Alaska. I crunched the numbers. The detour would add another 3 hours onto our drive and an unknown amount of hours to our day for whatever adventures we got into out there. "Not bad, not bad," I thought. When I brought it up to Ry, it wasn’t much of a discussion. He was completely on board for having one last romp around Alaska. I rerouted us and we were on our way. The “we made the right decision" moment came shortly after we pulled off of the highway and were greeted with Bear Glacier on the west side of the road. That wouldn’t be our last glacier of this detour. After passing through the last town in Canada, called Stewart, we saw a “Welcome to Hyder, Alaska” sign hanging above the pavement and that was that. No customs. No showing of the passport. We were in America. There were several quaint bars and restaurants that line this main street, appropriately called Hyder Avenue, but only one will truly get you “Hyderized,” a term invented to lure tourists into The Glacier Inn to take a strong shot and receive a certificate. We passed on this because alcohol and driving don’t mix. We continued down Hyder Ave until it turned into NFD 88. Four miles down this road and we were at the Fish Creek Wildlife Observation Site. This area is highly, highly trafficked by wildlife so cars are advised to drive slowly and cautiously. It is also advised that you remain in your vehicle or on the gated boardwalk that meanders along the river as bears and wolves frequent this area to fuel up on delicious salmon. Because of this, dogs are not allowed out of the car. It was a quick walk so we didn’t mind leaving them to take a rest in the backseat. I was shocked at how emotional it was, watching the salmon fighting against the current to spawn and live out their last moments before offering their nutrient rich carcasses to the animals that feed on them and the rivers and oceans that were once their homes. It was like watching nature being created in front of me. It was truly beautiful. After drying my tears, we picked up a map of a self-guided driving tour to Salmon Glacier. The dirt road passed by mines, both old and new, and stunning lakes and meadows before it gave up views of the big ticket item of the Salmon Glacier. 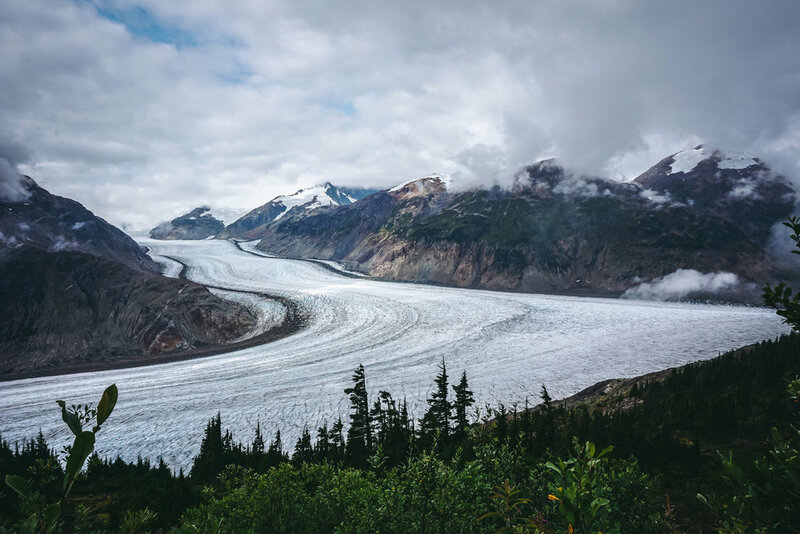 Salmon Glacier is technically on the Canadian side of the border and it is the fifth largest glacier in the country. The drive took about an hour with plenty of stops to gawk at the incredible mass of ice. Afterwards, with food on our minds (as it always is), we tracked down some side-of-the-road halibut that had been calling our names. We put our order in and relaxed on the patio of a big, old bus with a mural painted down the side while we patiently waited for the charming local woman to cook up halibut that her husband had caught that day. We ate plenty of fish during our month of travels, some of which we caught ourselves, and we both agreed that this was far and above the best halibut we had ever eaten in our lives. And likely ever will. Seriously. Go to Hyder to eat at The Bus. Everything else is just a sweet little bonus. With full bellies, we decided to make one last stop, which was recommended to us by a lovely couple also dining at The Bus. We took a soft turn down Wharf Road, which led us past what looked like an old landfill are, and onto Indian Ave. A few hundred feet down and BOOM! We were on the outlet for the Salmon Glacier runoff that leads into the Portland Canal. The next hour was consumed with watching bald eagles swoop down to scoop up salmon for lunch, and of course, fetch with the dogs. During that hour, I kept taking deep, dramatic sighs of contentment. It was the perfect ending to a perfect detour. A native of Portlandia, Kelsey Kagan and her husband Ryan took a risk and moved to Utah with their two dogs for a year to explore the deserts of Moab and Utah's five National Parks after work hours on the weekend like true weekend roamers. After the year was up, they moved back to their native land of Portland, Oregon. 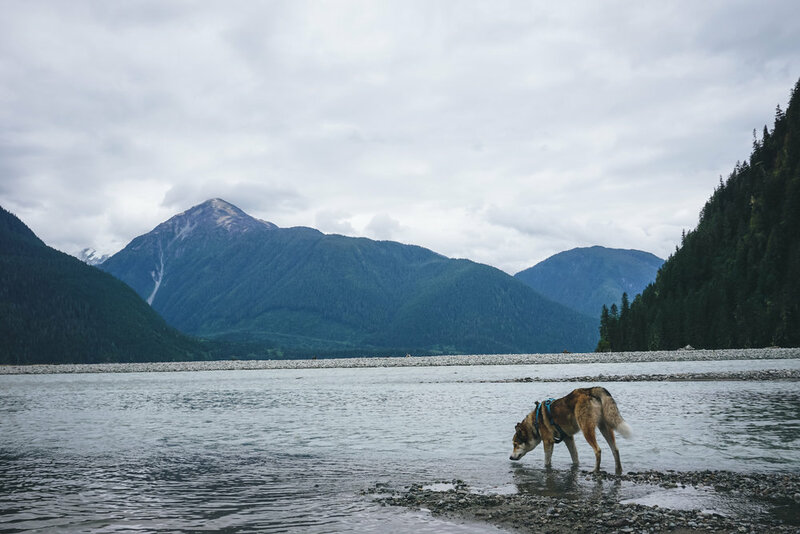 As they are major outdoor enthusiasts, you can learn how to live a well-balanced, outdoor lifestyle by following Kelsey, Ry, Jasper, and Osa on Instagram @kelseykagan and kelseykagan.com.